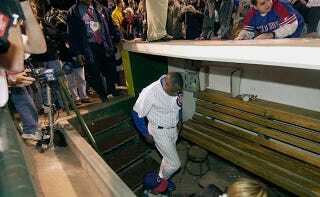 OK, Who Pooped In Dusty Baker's Dugout Spot? Jon Paul Morosi has a nice little profile of Cubs manager Mike Quade, but he buries the lede. Namely, that in Dusty Baker's last season in Chicago, someone left a going-away present for him. "At the very end, somebody took a dump right where I stood in the dugout every day," Baker said Monday morning. "That was the low point. The grounds crew guy cleaned it up. He said, ‘Oh, I think it's dog crap.' I said, ‘No it ain't. That's human crap.'" Baker says he still doesn't know who the poopetrator was, so it's unlikely we can I-Team this one and find out. But it's still fun to speculate. Noted public pooper Nyjer Morgan wasn't a major leaguer yet, so he couldn't have done it as a visiting player. Noted crazy person Milton Bradley wasn't a Cub yet. So let's look at the Cubs roster from that year and see if any names stand out. It could be Prior or Wood, angry at Baker for ruining their careers. Or noted prankster Greg Maddux, trying to rekindle his love for the game. But...oh, who are we kidding here? Ninety-nine percent chance it was Carlos Zambrano.